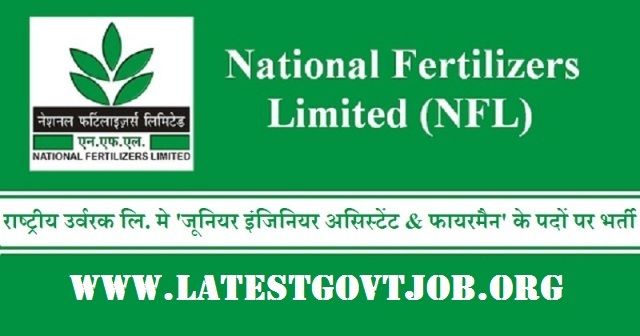 NFL Recruitment 2018 for 129 Junior Engineering Assistant and Fireman @www.nationalfertilizers.com : National Fertilizers Limited (NFL) has released a notification for the recruitment of 129 Junior Engineering Assistants and Firemen. Interested candidates may check the vacancy details and apply online from 19-05-2018 to 17-06-2018. General/OBC candidates have to pay Rs. 235 through online mode using Net-banking/Credit or Debit Card. SC/ST/Ex-Servicemen and PWD candidates don't have to pay any fee. Interested and eligible candidates may apply online through NFL website - http://www.nationalfertilizers.com/ - from 19-05-2018 to 17-06-2018.